Be clear about what a college education means and what sort of skills your students should have upon graduation. If you are, University of Chicago (UC) President Robert Zimmer argued recently at the University of Richmond, your stance towards free expression will follow. In his case, UC has a long history of welcoming ideas from vastly different traditions. A case in point is the story of Ronald Coase, a recipient of the Nobel Prize in Economics. UC economics professors invited Coase, friend and advisor to the Fabian socialists, to dinner to discuss what none of them believed at the time, namely, his idea that the case for government interference in economic affairs was relatively weak. Coase persuaded his peers to accept his viewpoint, and his idea later became known as the Coase Theorem. Four years later, Coase joined the UC faculty. For Zimmer, the UC policy on speech is a natural counterpart to the UC tradition of welcoming different ideas and follows from a commitment to educating students who have the skills to encounter different viewpoints successfully. At his well-attended conversation with University of Richmond President Ronald A. Crutcher, Dr. Zimmer focused laser-like attention on the issue he has championed for years—free expression on campuses. 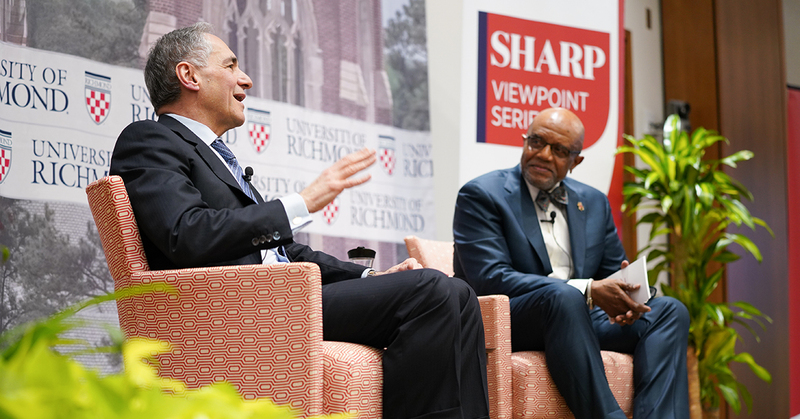 The event was part of the Sharp Viewpoint Speakers Series, a program sponsored by the Office of the President to bring different viewpoints to campus. Near the end of the interview, President Crutcher asked whether Zimmer would have altered anything if he were offered a re-do. Zimmer replied that he would have moved along the policy of free expression sooner. Universities and colleges were paralyzed for too long in the aftermath of several attention-grabbing incidents where speakers were disinvited to campuses, he said. In response to Dr. Crutcher’s remark about power differentials and speech, Dr. Zimmer replied that the institution’s culture must ensure that all have the ability, skill, and status to speak on equal footing in a conversation that requires real and active listening as well as speech. At the Jepson School, we regard leadership as a process, one that involves not only context but also a give-and-take among leaders and followers. Such a process necessarily includes speech. And speech is useful to leaders and followers only to the extent that it sifts through different points of view. Thus, for us, speech and discussion are integral to leadership. Seen in this light, the conversation between presidents Crutcher and Zimmer was about leadership–about how effective leaders must actively listen and ensure that followers feel confident, capable, and powerful enough to speak with authority and influence.